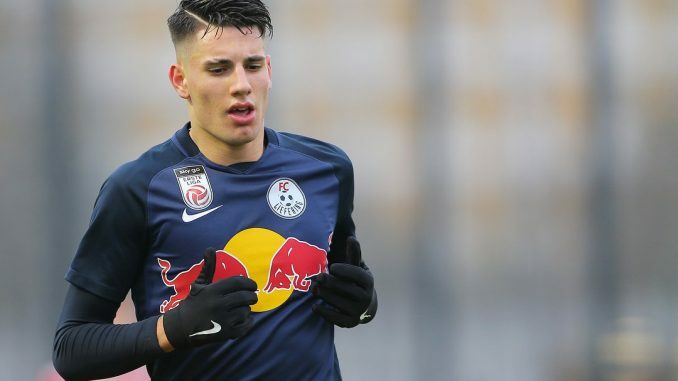 Arsenal are reportedly interested in securing the signature of 18-year-old Red Bull Salzburg central midfielder Dominik Szoboszlai, and the club have been following the star for a long time, according to the latest reports. A Spanish daily sports newspaper Diario AS report that the north London heavyweights are among several sides interested in the star. Bundesliga side Bayern Munich and Serie A pair Juventus and Inter Milan are the other three planning to lure the teenager away from his current deal with Red Bull Salzburg lasting to June of 2021. According to the same story, the price for Dominik would be around €10 million, so he surely wouldn’t be out of the Gunners’ summer price range. However, the question is whether Arsenal think he’s worth the investment. In spite of his age, Dominik already has a great physical presence, standing at around 6’1″. He’s been extremely effective in front of goal with Red Bull Salzburg’s feeder club FC Liefering as well, netting six goals and picking up four assists in just nine matches. His form earned the star a die Roten Bullen call up in the ÖFB-Cup (also knowns as known as UNIQA ÖFB Cup), where he netted another goal and provided an assist. Since then, Dominik’s started to get chances in Red Bull Salzburg’s Austrian Bundesliga games, making four substitute appearances towards the end of 2019. Serie A champions Juventus are also said to be interested, after the star’s name was included on the Bianconeri’s supposed transfer target list was leaked the previous month.